The pyramid and the underground lobby beneath it were created because of a series of problems with the Louvre's original main entrance, which could no longer handle the enormous number of visitors on an everyday basis. 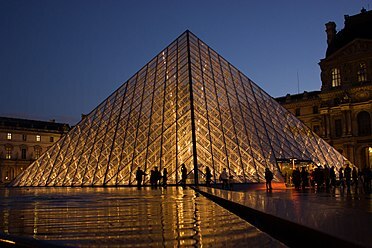 Visitors entering through the pyramid descend into the spacious lobby then ascend into the main Louvre buildings. For design historian Mark Pimlott, "I.M. Pei’s plan distributes people effectively from the central concourse to myriad destinations within its vast subterranean network... the architectonic framework evokes, at gigantic scale, an ancient atrium of a Pompeiian villa; the treatment of the opening above, with its tracery of engineered castings and cables, evokes the atria of corporate office buildings; the busy movement of people from all directions suggests the concourses of rail termini or international airports." Several other museums have duplicated this concept, most notably the Museum of Science and Industry in Chicago. The Dolphin Centre, featuring a similar pyramid, was opened in April 1982, by Prince Richard, Duke of Gloucester. The construction work on the pyramid base and underground lobby was carried out by the Vinci construction company. The Courtyard of the Louvre Museum at night. The Courtyard of the Louvre Museum during the day.